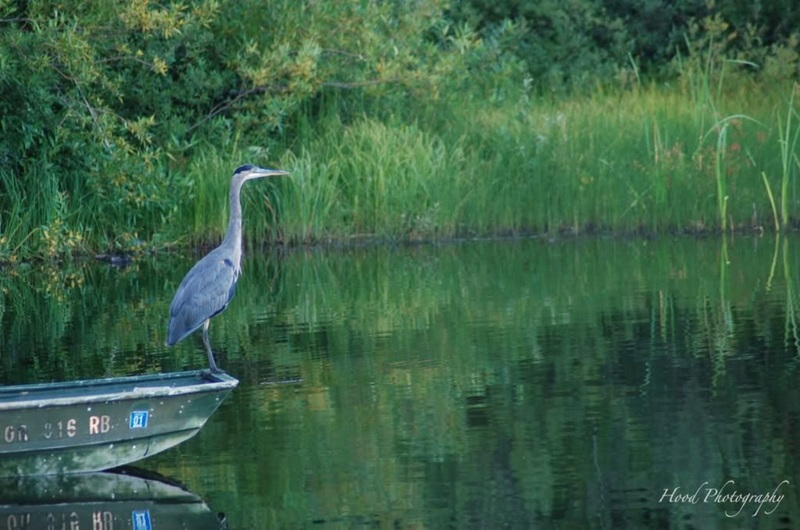 We were sitting at our favorite lake fishing this past weekend, and all of a sudden this large blue heron flew right in front of us. We were at the end of the lake where sometimes fishermen park their rowboats, and it landed right there and just sat. Perfect! I grabbed up my camera and took advantage of the opportunity. Usually the blue herons at that lake are a bit more elusive, and you can only see them from a great distance. We lucked out! What a situation! Great shot! Gorgeous. I am from Oregon, living in PA now... miss Mt Hood! Very good photo. I've tried to capture them before, also. Beautiful!!! And they are so huge, the nice thing about that is that they are very visible when flying. I love seeing them and you really did luck out. We have those in Manitoba as well as the Sand Crane. They are also large and sit in fields near water. He looks like he's just standing there waiting for his picture to be taken. Beautiful! They are awesome birds! What a beautiful photo. What a great opportunity for a great photo! Yes you did luck out - that is a fantastic capture!